The majority of buyers have positive remarks for the shoe’s aesthetics. 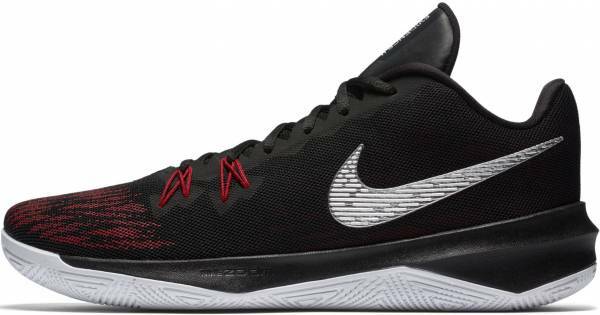 Some of them say that if it had the Kobe logo, the Zoom Evidence 2 could pass as one of his shoes. The Nike Zoom Evidence II is one of the shoes where the Air unit can be felt, especially when the midsole is broken in. A couple of reviewers say that the bounciness of the unit feels like the ones on the Kevin Durant 11th Nike signature shoe or the Hyper Rev 2015. Some users love how the Flywire in the forefoot helps contain the foot when doing hard lateral cuts. Several wearers notice that the Evidence 2 uses lightweight materials both for the upper and midsole, making the shoe a good option for guards who need speed during play. Due to the thin Engineered Mesh upper, most of the reviewers say that ventilation is very good. Performance shoes like these and the 5th Kyrie Irving basketball shoes with Nike have proven good breathability. The solid rubber outsole works well on not-so dusty courts but better on outdoor courts. One tester comments that the heel-to-toe transition of the shoe feels nice. Some of the testers say that the Engineered Mesh used on the upper feels and looks cheap. Several users find the heel cushioning to be very stiff, not too plush, and quite uncomfortable. Majority of the wearers feel that the Zoom Evidence II runs big, creating a dead space in the toe area. One user reports that the Zoom Air unit's bulge presses pretty hard on the ball of his foot. The shoe's upper material does not offer much support, especially when the shoe is already broken in when the upper has stretched a little. Overall, the shoe is a solid performer at an affordable price, most especially when it goes below retail. The traction pattern attracts some dust, but a few light wipes will be enough to give you several good stops. The midsole’s forefoot Zoom Air unit can be felt, and it provides responsive cushioning. The upper of these low-top athletic sneakers is breathable and comfortable. If it was more expensive like $110 or $120... I'd be a little iffy, but it's 90 bucks, one of the cheapest.. And the performance is pretty damn nice. So performance is good and it's very cheap. Released as one of Nike’s budget basketball shoes, the shoe continues the Evidence legacy. The Evidence 2 features a triangular traction pattern, a forefoot Zoom Air unit within its Phylon midsole, and an engineered mesh upper. Cushion. Housed within the forefoot is a Zoom Air unit that bulges out slightly from the Nike Zoom Evidence 2's bottoms. The Air unit allows the wearer to stay on his or her toes. Due to the unit's responsiveness, the shoe is ideal for fast-paced plays. Traction. The shoe's outsole features a multidirectional triangular tread pattern. The grooves are not very widely-spaced thus dirt may get caught. However, only light wipes are needed to refresh the shoe's soles. For players who are fans of that reassuring outsole squeak, this shoe has a lot of it. Length and Width. Although the width fits true to size, the shoe runs long. It is advised to visit your local shoe store to fit the Zoom Evidence II personally. If the width of your foot permits, you can go half a size down. Lockdown. The shoe’s tight fit is attributed to the supportive midfoot Flywire cables that provide containment during quick lateral cuts, the heavily-padded collar that adds security to the ankles and reduces the possibility of heel slippage, and the padded tongue that runs to the toes to ensure comfort. The Nike Zoom Evidence II uses Engineered Mesh for its upper. The material is overlaid with a rubberized fuse on the forefoot and lacing area to ensure durability. It is lightweight and thin, allowing ventilation within the shoe. Below the upper, the tongue extends up to the toe to add comfort and improve the fit, akin to the Tech Fit Booty technology by Adidas. The midsole cushion is made of Phylon. Encased within it is a Zoom Air unit at the forefoot. Some colorways have solid rubber outsoles while others are paired with translucent rubber. Solid rubber outsoles are safe for the outdoors. The translucent rubber, however, is best used indoors because it is made of a pliable compound that burns easily on concrete surfaces. As a low-top basketball shoe, the silhouette looks similar to some of Kobe Bryant’s shoes. The design plays with subtle geometric shapes that run from the shoe's heel to the midfoot. The forefoot, for its part, is adorned with dual-toned mesh. A large Nike swoosh is embossed onto the medial and lateral sides of the shoe. The Nike Zoom Evidence II comes in more than five different colorways. The more popular ones are the Wolf Grey/White/Cool Grey, Dark Obsidian/Light Carbon/Gum Light Brown/ White, Black/Cool Grey/Metallic Gold, Black/White/Wolf Grey/Metallic Silver, and Black/University Red/White/Metallic Silver.